Choosing what to cook is a very big task in my kitchen. Omar and Ozzy are exceptionally picky eaters. I do not know where they get that from, but it is definitely not from me or my husband. Every morning when I brainstorm about the daily menu, Omar pops-up in front of me and politely explains, that he again wants noodles-with-eggs-and-meat for his lunch, brunch and dinner! I should be happy that he is not refusing to eat altogether. So, to spice up his dinner, we always come up with different ideas of utilizing the dough, combining it with vegetable broth for some nutrition. 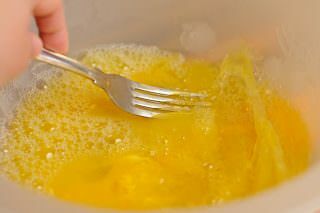 Talking my son out of not eating eggs every day, is another big story! 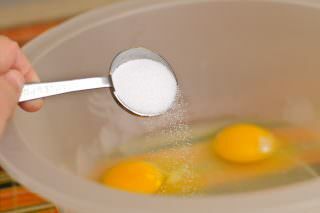 In a medium bowl mix warm water, eggs, salt well. 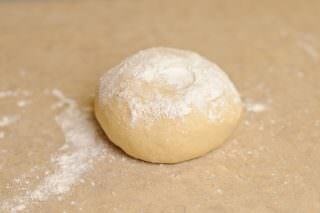 Add flour and knead the mixture for 10-15 minutes, creating a nice, springy dough. 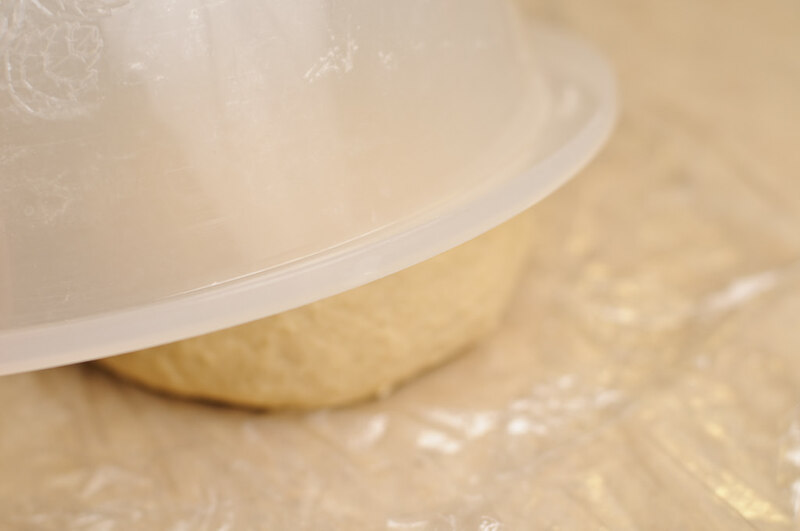 Make the dough round and cover with a plastic wrap or with the container it was kneaded in. Let the dough rest for 15-20 minutes. Meanwhile, prepare the ingredients of the soup. Wash all of the vegetables. 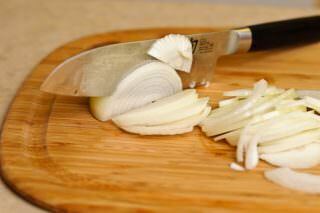 Cut onions in 1/4 inch half circles. 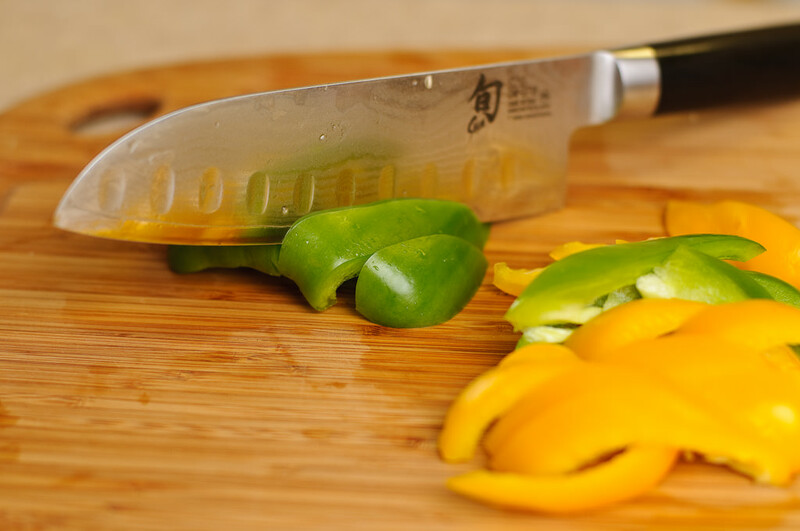 Cut peppers in 1 inch thick strips. Julienne carrots thinly. 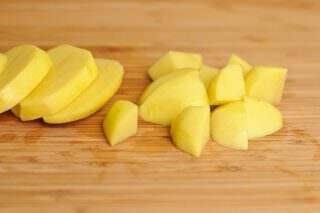 Peel the skin off potatoes, wash them and cut them in bigger cubes. 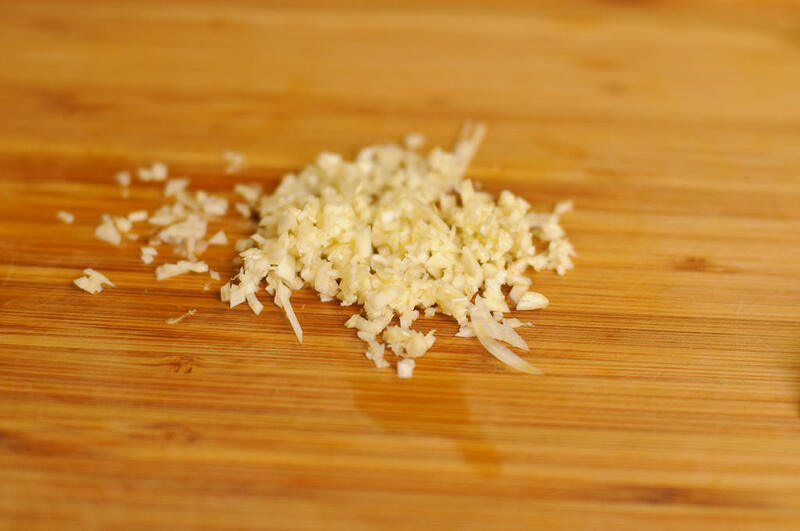 You can use minced garlic, but I prefer to chop it, because it tastes better that way. Slice the tomato thinly. 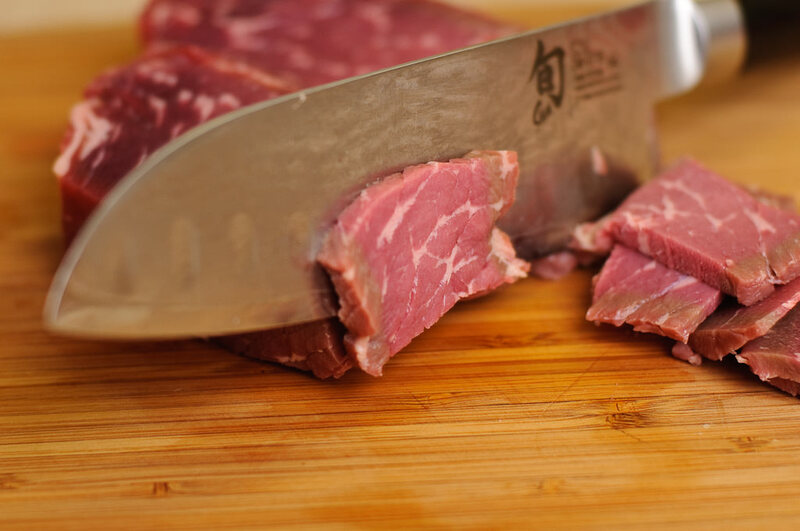 Julienne the meat. Pre-heat your Wok on high heat, add oil. 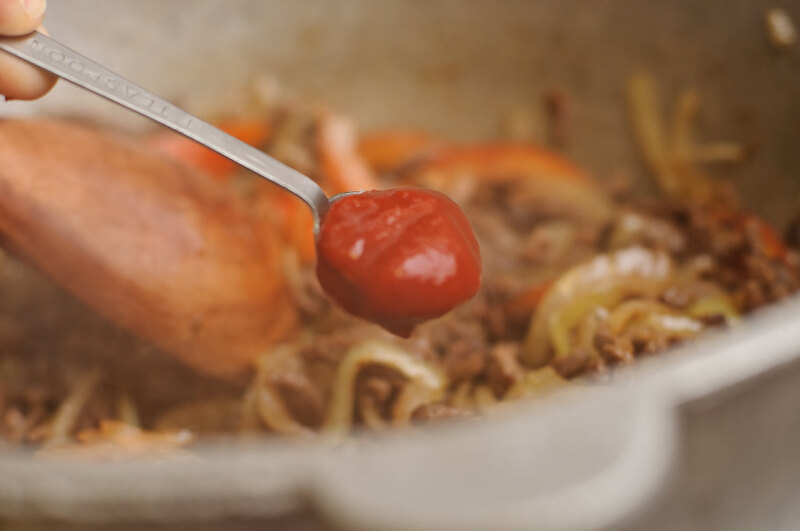 Toss the julienned meat into the Wok and stir-fry until light-brown. 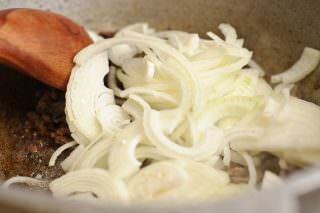 Add the onions to the meat. 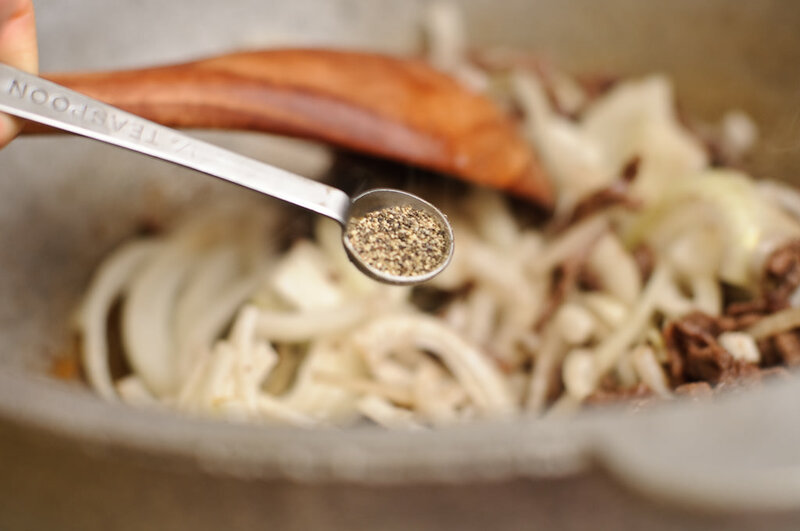 Add spices (black pepper, cumin, salt) and stir fry until onions are golden in color. Add the tomato, tomato paste and half of the chopped garlic. Mix everything well and stir-fry until tomatoes are nicely soft. Boil water in a bigger container, add salt and keep it simmering until the dough is ready to be cooked. 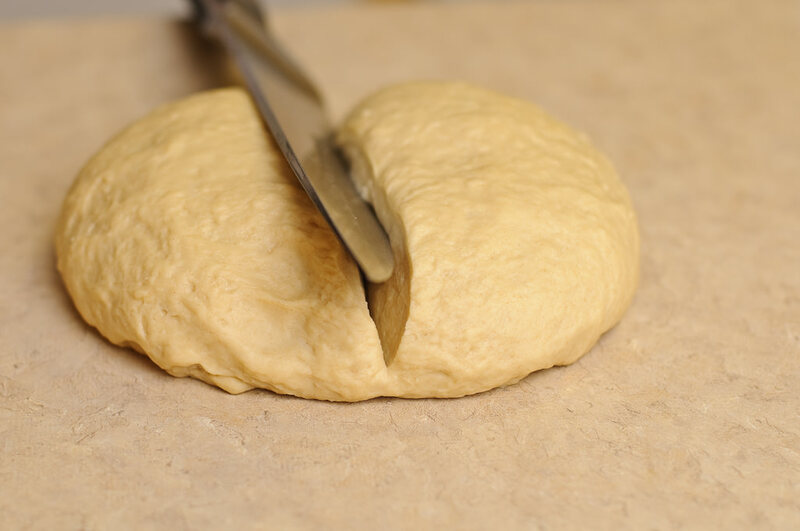 Take out the dough and cut it in two equal portions. Keep one of them under the plastic wrap. Take out the other and roll it until you have a big, thin circle. 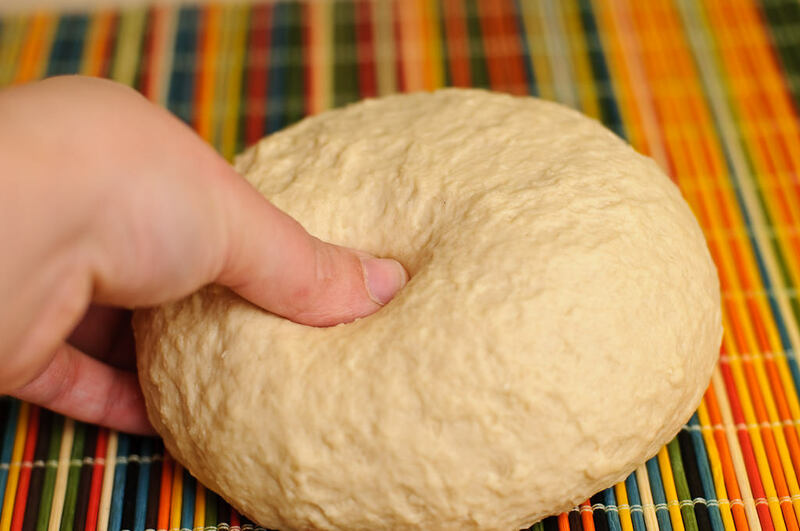 Use flour generously to prevent the dough from sticking. 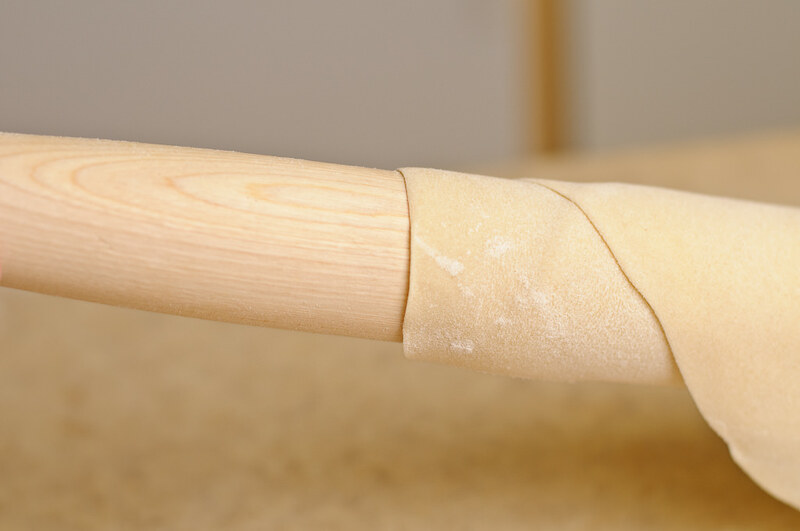 Sprinkle the flour on the dough one more time and roll the dough to the rolling pin loosely. Slide the rolling pin out from one end, creating a tube from the dough. With a sharp knife make 1/2 inch cuts on the tubed dough. 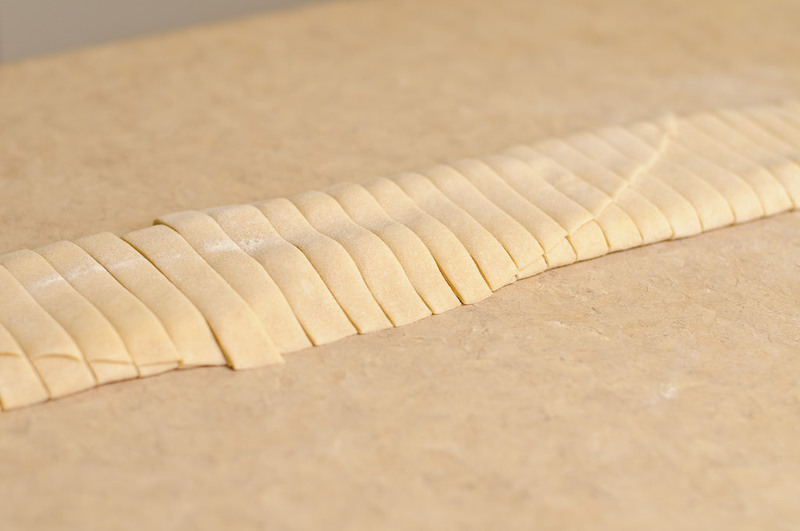 Loosen the strips and stretch them out in order to have even, thin noodles. 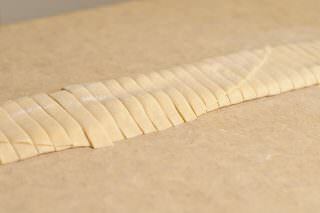 You can also cut the strips thinner than 1/2 inches. Make sure the water is boiling. 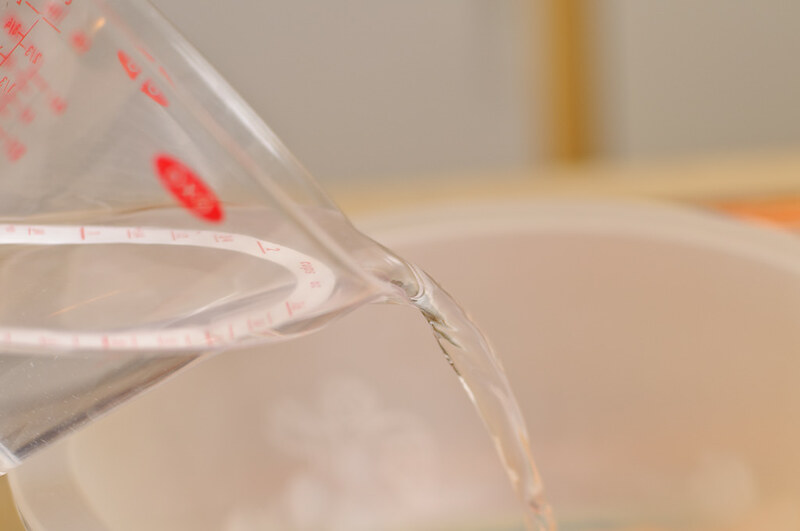 Carefully immerse the ready noodles in the water. 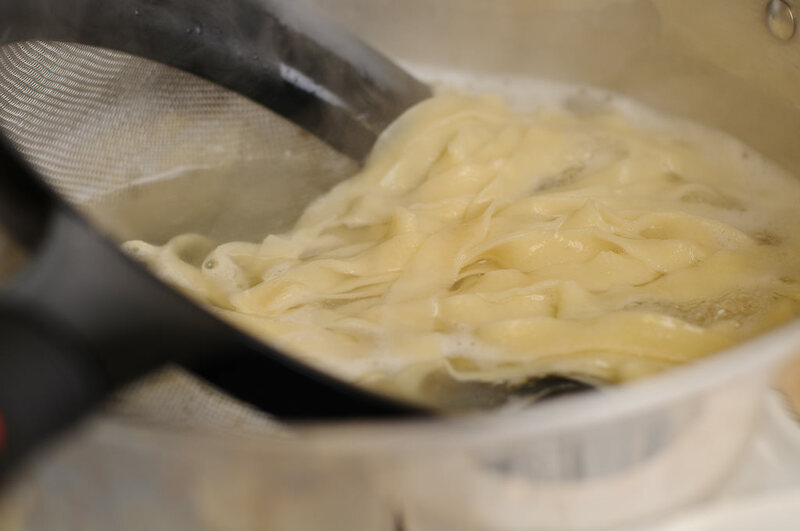 Cook the noodles for 3 minutes. 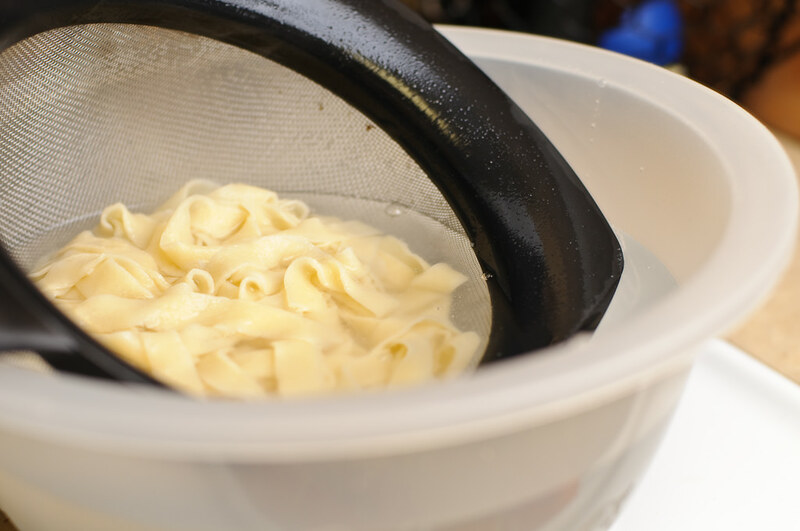 When time is up, take out the noodles and rinse them in cold water for 10 seconds. Place the ready noodles in a container or a big dish, add 1 Tbsp of oil and evenly distribute it. This will prevent the noodles from sticking to each other. 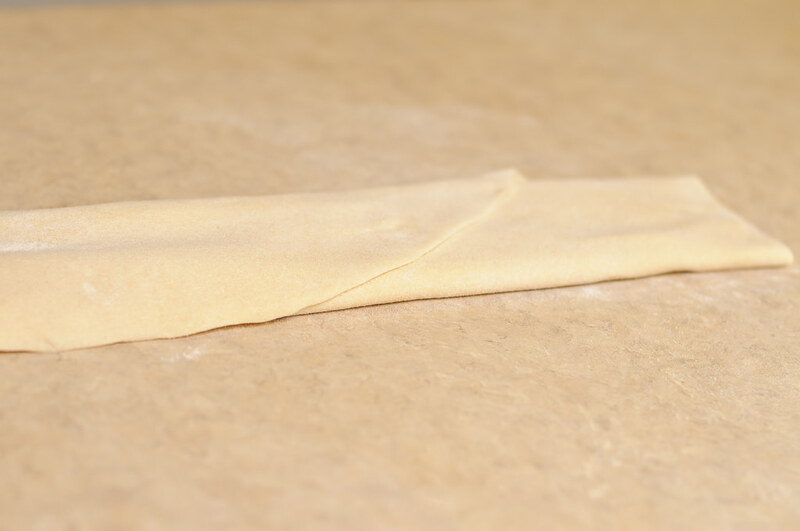 Continue with the second batch of the dough and use the remaining 1 Tbsp of oil for those noodles. 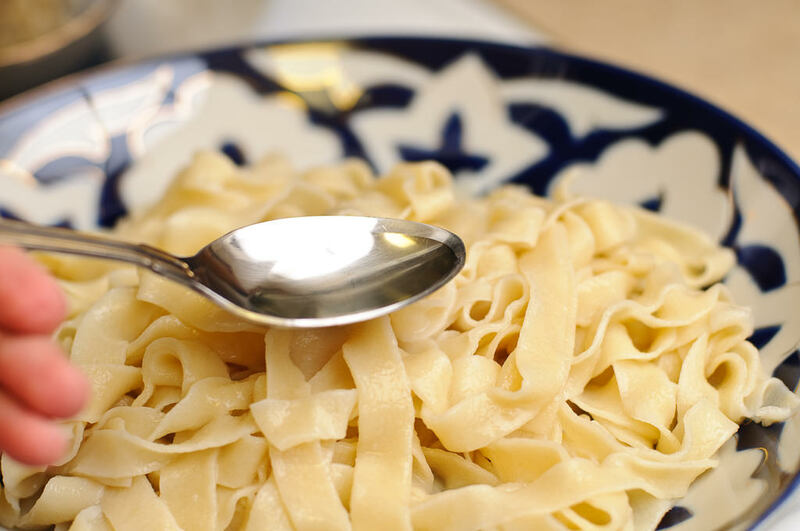 Add some noodles to a soup bowl (we use Uzbek traditional soup bowls) and simply pour the hot soup over the noodles and you are ready to go! 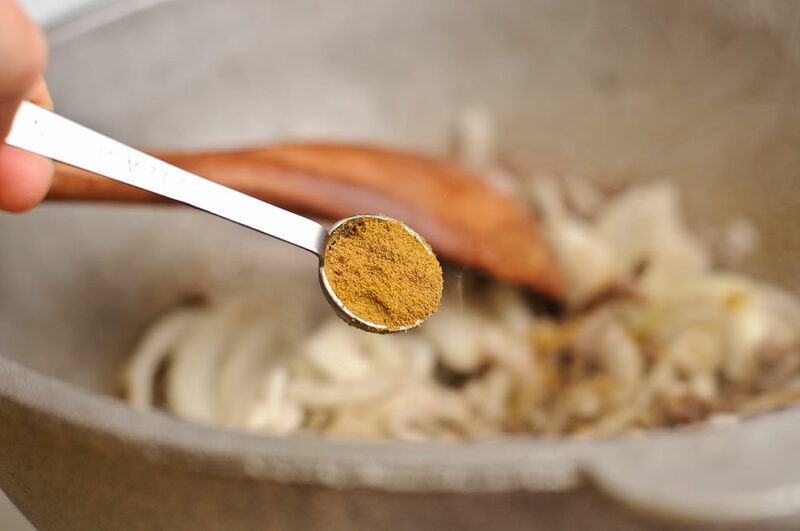 Serve with your favorite herbs. I love it with scallions and my husband likes to add a little Sriracha hot sauce and a dash of vinegar. If you have any questions, please let me know in the comments section below. I always love your process photos, and these are definitely no exception. 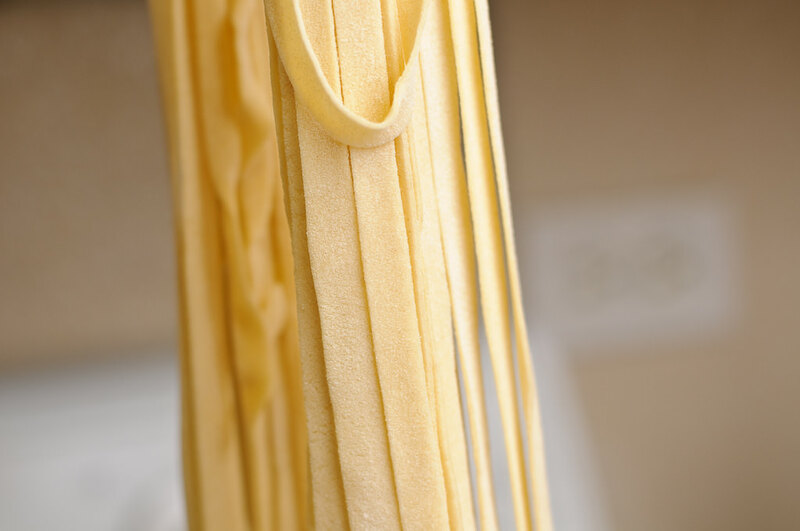 The noodles are beautiful. I think it’s so sweet that you make homemade noodles on a regular basis. 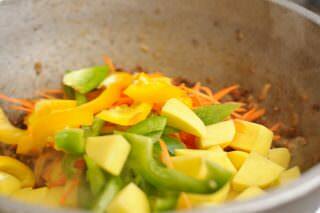 I’m looking forward to your next version of lagman. This is great! I’m so glad that you post all of these wonderful Central Asian dishes, because I’m moving Kyrgyzstan in a few months. This gives me an opportunity to try these out before I get there! Oh, Kristin! Your job is pretty tough. Why on earth are they sending you to Kyrgyzstan? I guess it is better than going to Iraq for sure. There are some amazing people down in Kyrgyzstan and the food is to die for :) I am sure you will like it. Just be careful. Once you get used to eating in US, you might get a slight food poisoning (or so they call) while trying to get adjusted to the new food. Produces are mostly organic and seasonal. You are going there in Spring, it is going to be beautiful! Let me know if you have any questions about Kyrgyzstan. Which city are you going to be working at? I’m from Kyrgyzstan myself too. Lagman is my favorite food. 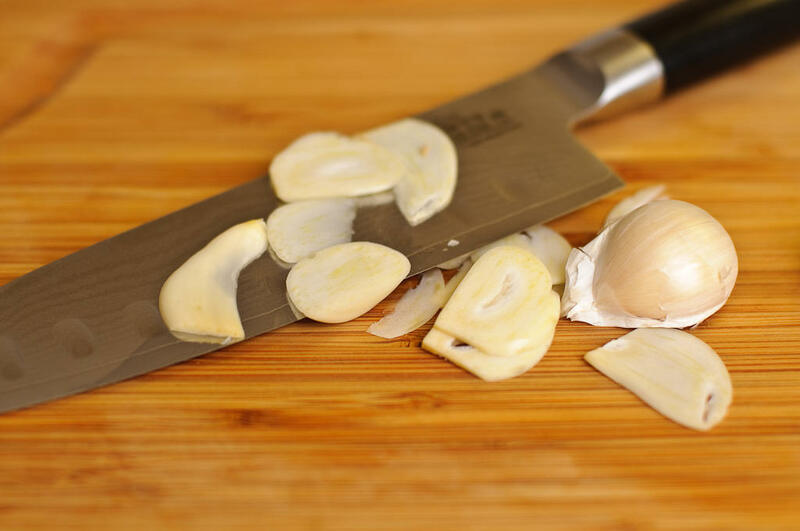 We also use eggplant, besides turnip( or black radish). Djusai: I cannot find it in US, but I can substitute with chives( salted in water). 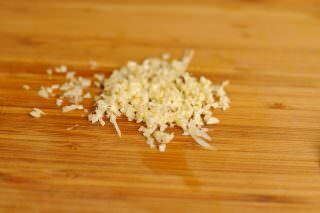 Kindza also used in lagman. 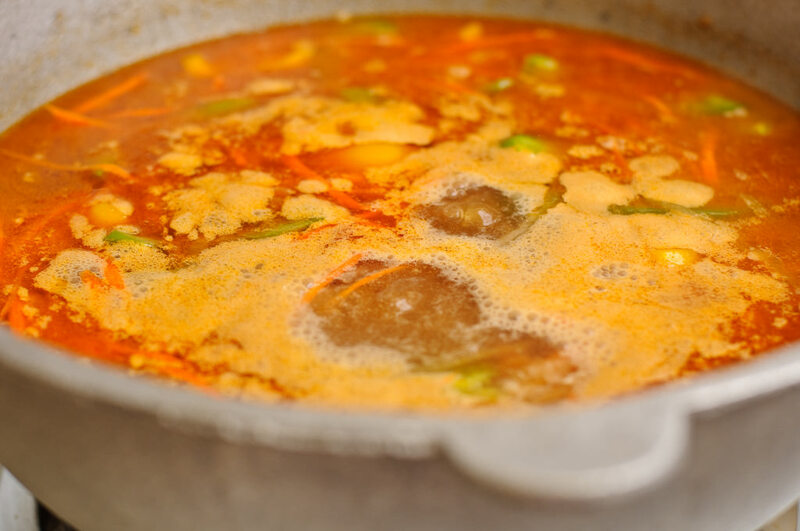 what kind of oil do you use for this soup? 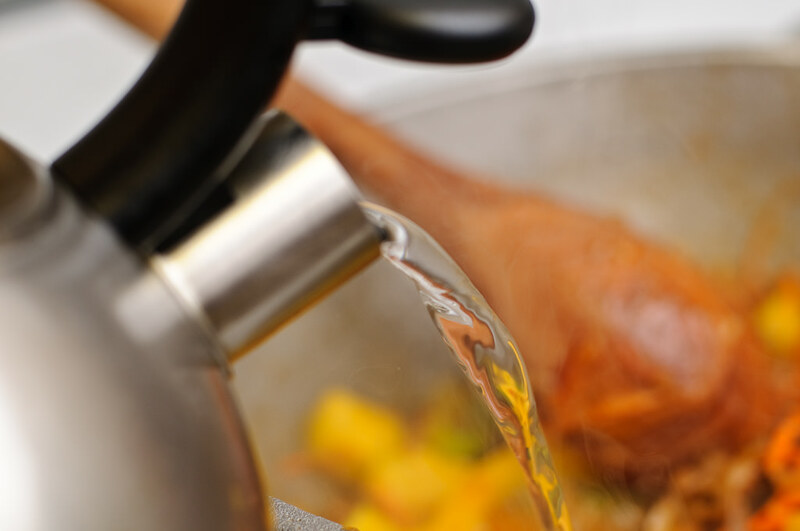 i figured it was canola oil…i make the soup today followed your instructions exactly as written and also added some chopped celery…the soup is amazing..my husband is in love =] thanks! I also wanted to ask for a mashed potato recipe..how do you make yours? Bring to boil and half cover the lid of the pot, turn the heat down to medium low. Let the potatoes simmer and get very soft. Once potatoes are soft enough to be mashed drain the water. Return the pot to the stove. Start adding milk. Add a small amount first and mash the potatoes. 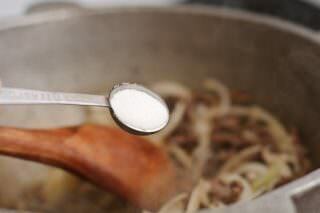 As you go along see if you need more milk to make the mashed potatoes thinner. 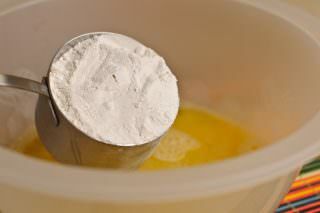 I also add 1/4 cup of heavy whipping cream or 2 Tbsp of unsalted butter. 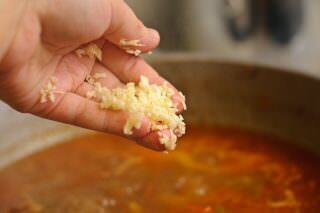 Once everything is well incorporated and there are no big chunks of potatoes in your mixture add salt. Depending on how many potatoes you used the amount of salt will wary. Add as much as you think is appropriate. kak po povodu “chuzma” lagman. 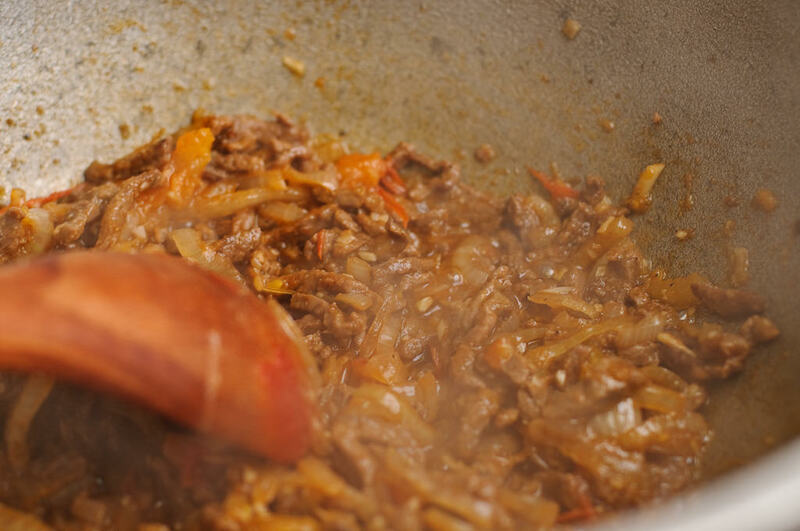 Kak mojno bistro i umelo nauchitsa rastyagivat’ nastoyawiy uygurskiy lagman? Thanks for the wonderful recipe. 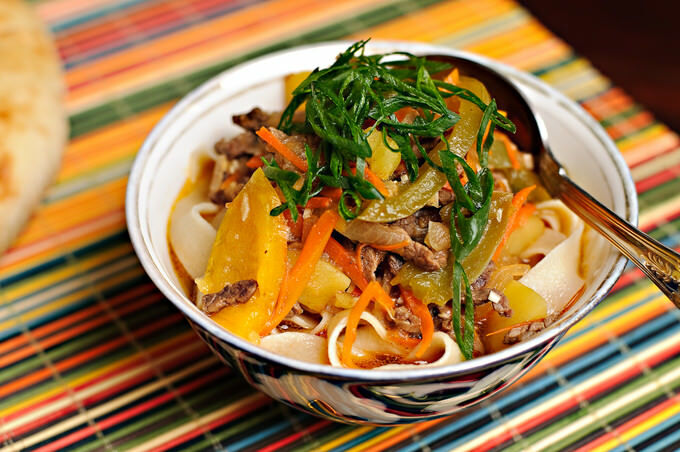 Lagman was a favorite meal during my visits to Kyrgyzstan. I cooked it for friends last weekend and they loved it-such a distinctive flavor. 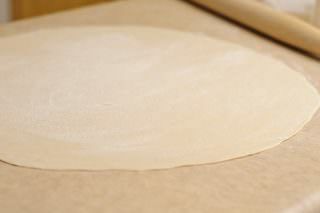 Of course the experience would not have been complete without the scrumptious Kyrgyz bread I prepared alongside. Oh WoW, Phil, you must be quite a cook! 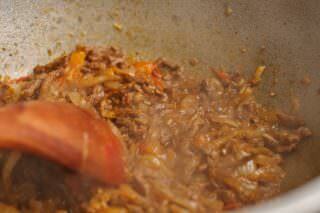 To took over lagman and Kyrgyz bread is a challenge :) Like they say, men are better cooks than women. I am sure it all came out super delicious! How did the funchoza turn out? If you still haven’t tried it, instead of ground beef you can use julienned beef strips. The salad comes out even better like that. Let me know if you need any help or suggestions. I will be glad to help you out!!! Привет. написал про ваш сайт и про лагман Насиму привет. Spasibo vam bol’shoe!!! :) Nasim vam tozhe peredaet ogromenniy privet!!!!! I like this noodles version, are totally similar to my mother’s noodles. Perfect!!! Ayniqsa, tepadagi rasmga gap yo’q! O’zim bilgancha ikki uc marta qilganmanu, shu professionallarcha reseptini yozbermessimi, shunga ko’ra tayyorlab ko’rardim. oldindan rahmat! Thank you for posting this recipe. 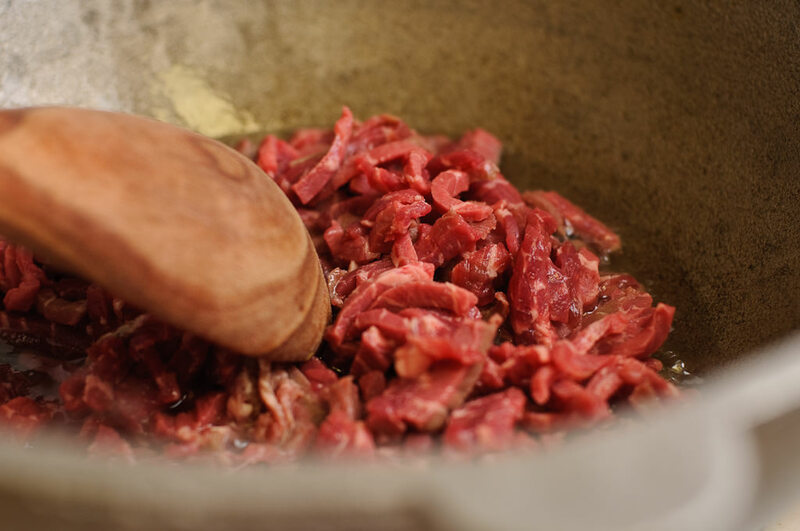 I am learning to cook some Kyrgyz dishes for my son who is adopted from Kyrgyzstan. This was a yummy recipe, although I fumble a bit with making the noodles. I do have one question, you mentioned 1/2 oil for the soup ingredient. 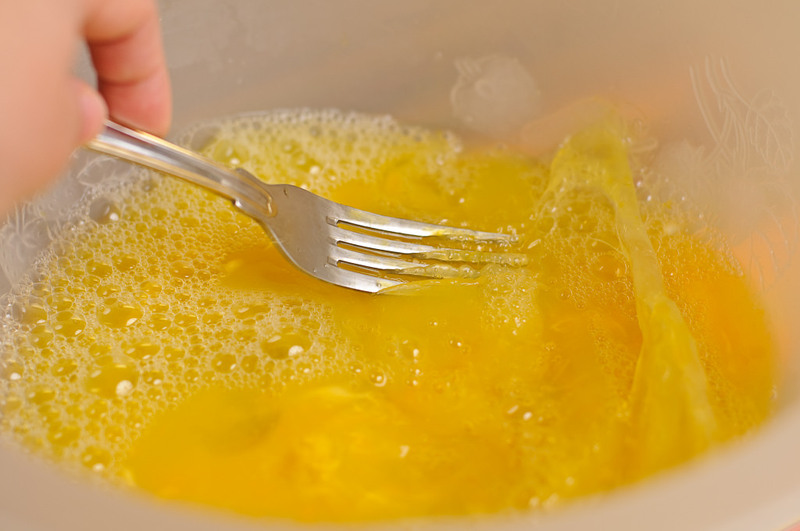 Did you mean 1/2 cup or 1/2 tbsp? 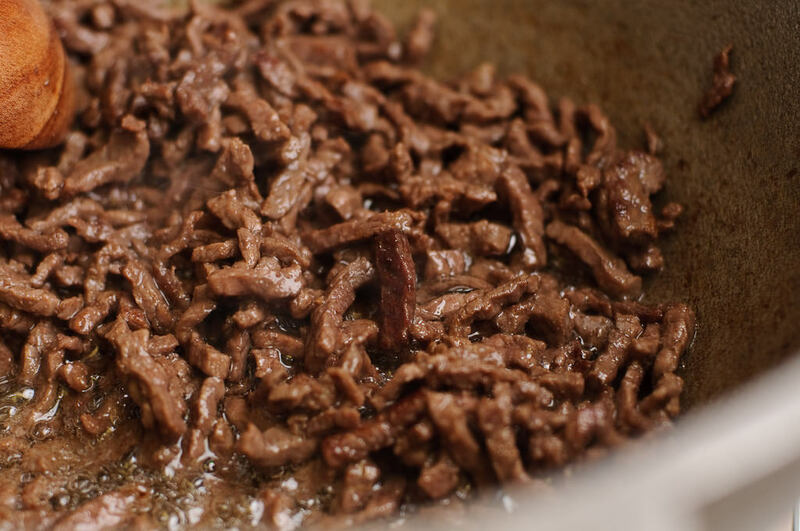 I put in around 1/4 cup in my dish because I used a lean cut of meat. Ivy, I am deeply sorry for I am getting back to you so late :( It is indeed 1/2 cup of oil for the soup ingredients but 1/4 cup works as good. I am so happy that you adopted a little dude from Centrail Asia :) Please extend our regards to him and we welcome you to our house anytime you wish. Bir narsa deyishga ojizman, rasmga qarab to`yishga harakat qivotman. QOYIL!!! GAP YUQ. MANAM XOZIR TAYYORLAB KURAMAN. RAHMAT SHUNAQA VAQTIZNI AYAMASDAN RETSEPLANI QUYGANIZ UCHUN. MAN BU SAYTNI ENDI KURDIM, LEKIN ENDI UNI “FAVORITE”GA QUYIB QUYAMAN. I moved to Kyrgyzstan about two years ago and I have to go back to the United States for a year and I couldn’t imagine going there and not being able to eat Lagman often. While looking for recipes I found this one and although it isn’t exactly what I meant I am going to cook it for my large family of nine tonight. 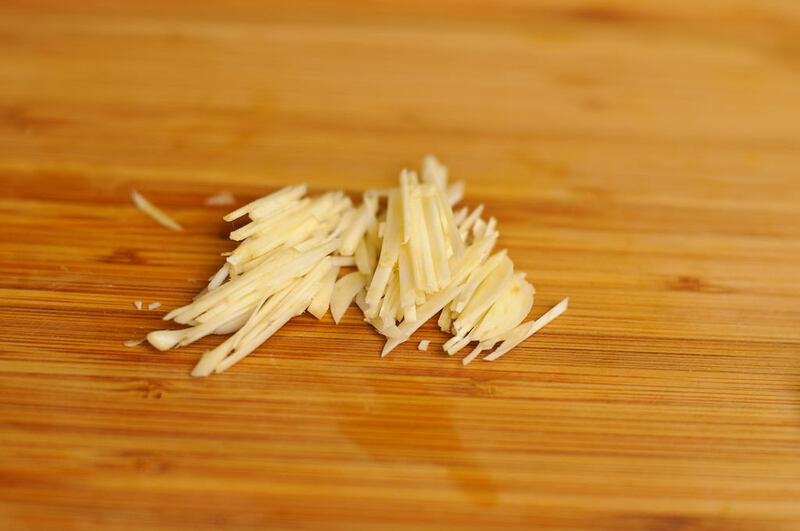 Everybody in my family is very picky though so I will not be making the soup but I am going to try the noodles plain. I’ll leave another comment tonight after I finish cooking and eating it. Thank you for the recipe. For the dough it says 3,5 cups all purpose flour. Does that mean “3 to 5 cups” depending on the consistency? Or did you mean 3 1/2 cups of flour? Thanks for clarifying! 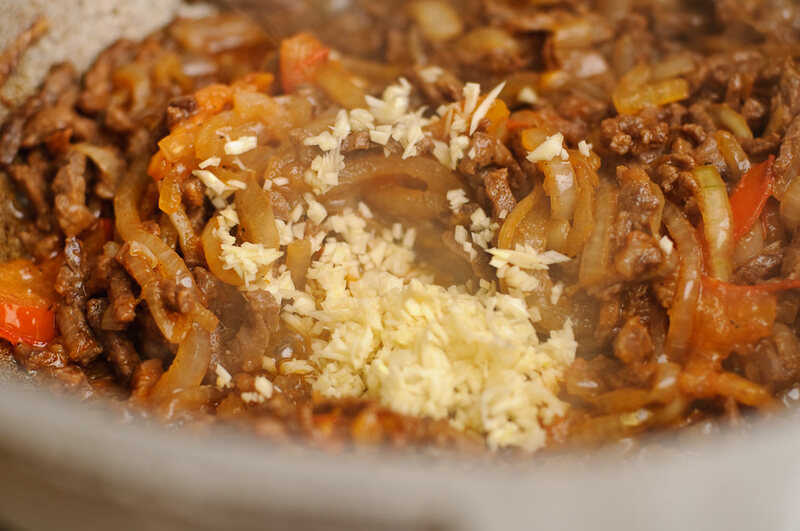 DO you have a recipy of covurma lagman? Thank you so much form the recipe. I was shopping and thought, I should make lagman. Have not cooked it for ages and forgot the recipe of the soup :) Sure enough I bought everything I need (passive memory works good). Nevertheless your site helped me to recollect the whole recipe again. 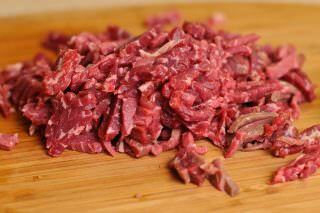 I grew up in Uzbekistan, my mom was the best cook. 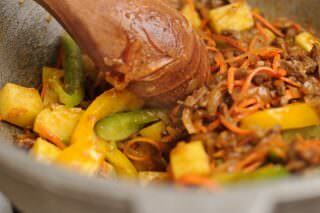 She used to make lagman, besh barmak, shurpa… My brother in law is the best plov (pallow) cook. But most of all I liked to read the comments. They are refreshing my Uzbek language. Spasibo vam ogromnoe za fotografii, o4en’ udobno, kogda ves’ process illyustriruetsya v fotografiyah. Thank you so much for sharing this recipe. My Uzbek husband took his first taste and right away, he smiled and said “it tastes like real lagman soup”. Our son loved it, too! You truly made me happy and now I know my husband has hope that I can cook Uzbek food like his mother! 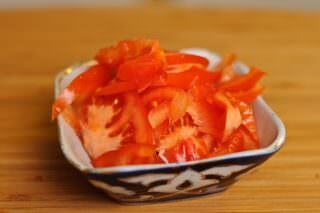 Please share more Uzbek recipes. ЗДРАВСТВУЙТЕ,ЛОЛА МАНСУРОВА..ВЫ ПОЛНОСТЬЮ МОЯ ТЕСКА.. ПРИЯТНО ВИДЕТЬ ВАС И ОЧЕНЬ ВКУСНО РАССКАЗЫВАЕТЕ.. This is one of the most amazing things I have ever eaten! 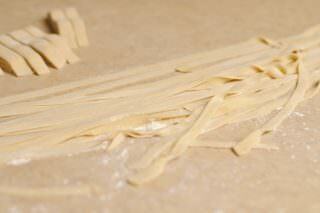 My noodles are a bit thick and rustic and still need practice though. I top it with Chinese sweet vinegar, and it’s become one of my favourite meals, thank you for posting it. 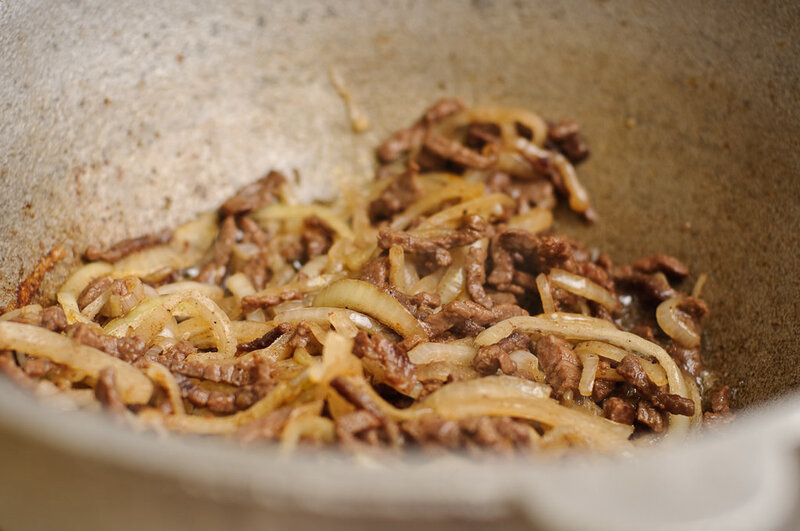 I am an American who travels to and from Central Asia quite a bit… Lag’mon is one of my favorite dishes ever, and though I can do it there with the help of a native friend, I always struggle to recreate it in the U.S. 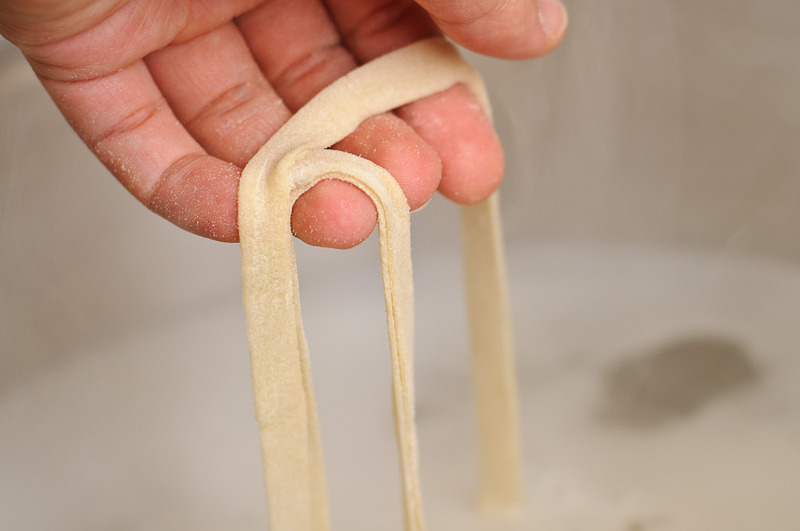 This is a great version, though I’m used to seeing round noodles. Do you have a non recipe by chance?? 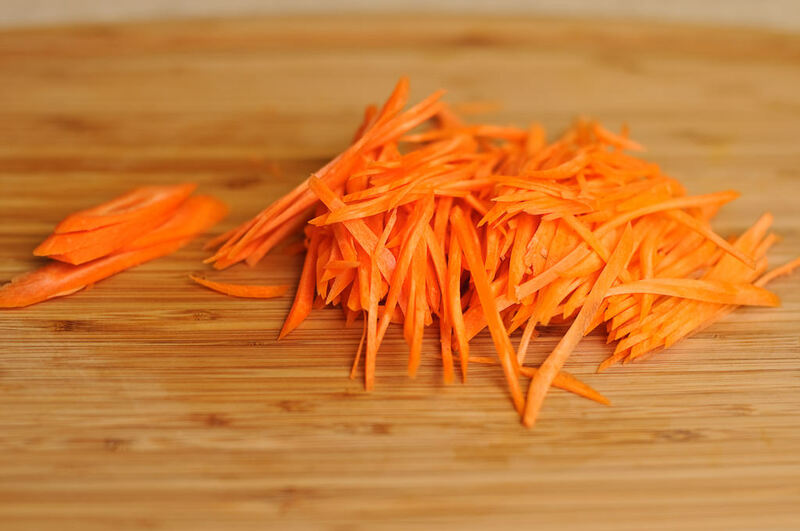 Hi Lola, Thank you so much for your amazing recipes and easy to follow directions, I love your style, I made this recipe and it was exactly if not better than the ones I ate at restaurants!!! 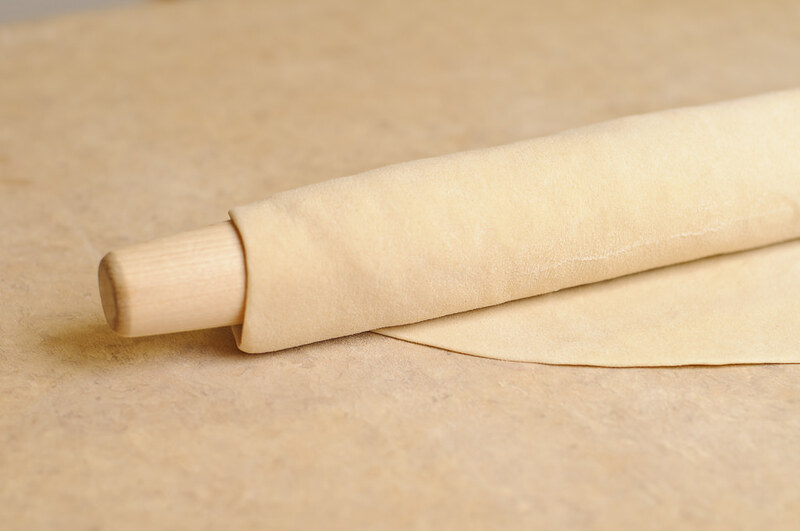 ill be honest though I bought ready dough, maybe next time I’ll make it. I have tried a number of your recipes and not one has been a disappointment!!! Thank you so much and I hope you keep doing what your doing! and finally, my personal preference is cilantro for the herb. 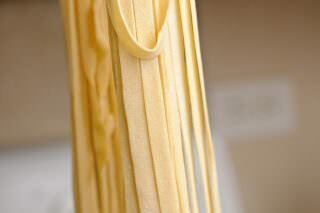 Lovely recipe, great memories, especially of the fettuccine that looked exactly like my mother’s! Hoping for more great recipes!!! Thank you very much for wonderful recipes of Uzbekistan’s cuisine. 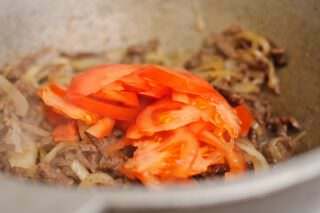 Please post more native recipes! Made this for my family tonight. I acquired a taste for lagman in Kazakhstan. This was great! I’ll admit that I used store bought noodles though.